Yes, you can make a lot of money if you trade carefully, have enough money to navigate through trades which turn bad (the worst thing which can happen to you is not having enough cash and get a margin call) and trade. No pain (risk), no gain. March was so far the best month making money trading the volatile market down (in February) and up (in March). In the first 9 days of March, we made $9,710 dollars. However, I still need to seriously work on reducing our accounts exposure, meaning that they are over-invested (over traded). 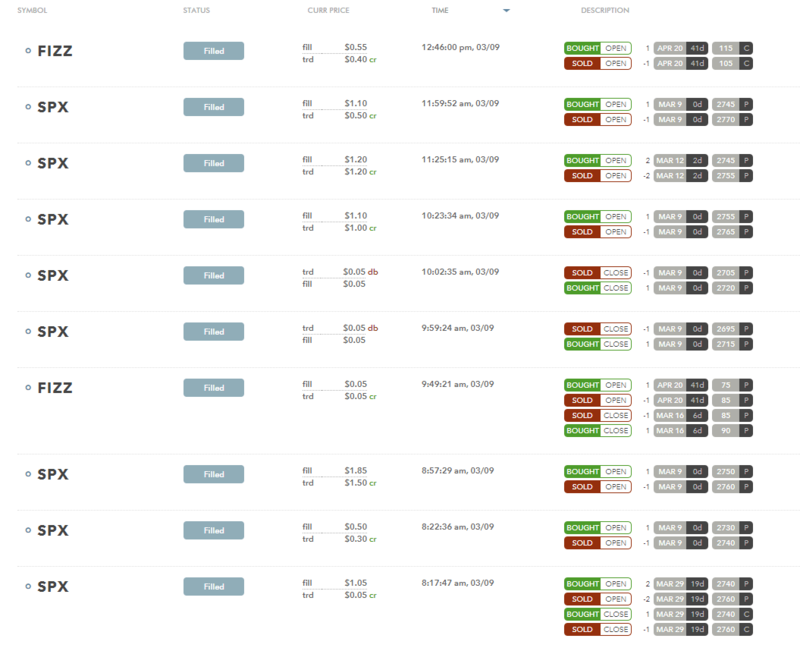 that means, that I am not going to be opening more new trades but only manage the existing ones. 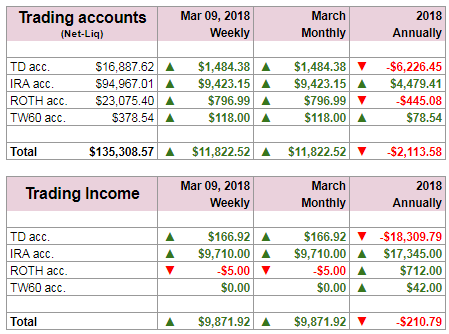 We have made enough money in the first 9 days of March to stay aside and do not trade. The only exception to this is our IRA account where we have enough buying power to trade, although in this account we will also slow down the trading activity to raise cash in preparation of future troubles. I still believe, this bull market has about 2 years left. On Friday the markets rallied hard and I took advantage of it. We rolled a few trades and opened a bunch of trades against SPX riding this bull up. The market rallied more than 40 points up creating new highs for the week. This brought nice cash. This was an outstanding month so far. We made money pretty much every day. I hope we will be able to keep this trend in the upcoming week. 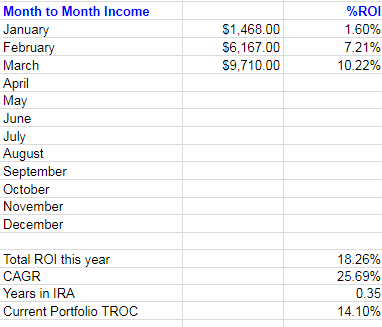 Last week, we made nice cash and it is our plan to use 50% of the options trading proceeds to buy dividend growth stocks from our watch list. 1) From the long term outlook the market is still bullish. We do not expect a bear market to start in 2018. The high yield spread is flat and has been since 2017 (at around 10% range). We need to see the spread going up to see the beginning of an end of this bull. 2) Trump’s tariffs are now behind us and they will no longer pose threat to this market short term. Now that we have a clear way, we can have an effect of the economy to influence the markets. We are still expanding although slowing down. This means we may see the market to make new all time highs before we loose steam. Bear markets do not start at the high trend momentum. We need to see the momentum to lose first. It is not yet happening. 3) We are still below now above 50 DMA which serves as a resistance and that may pose some short term difficulties. We now need to confirm the Friday’s breakthrough above the 50 DMA which I expect to happen next week. If so, the path to new ATH is open. 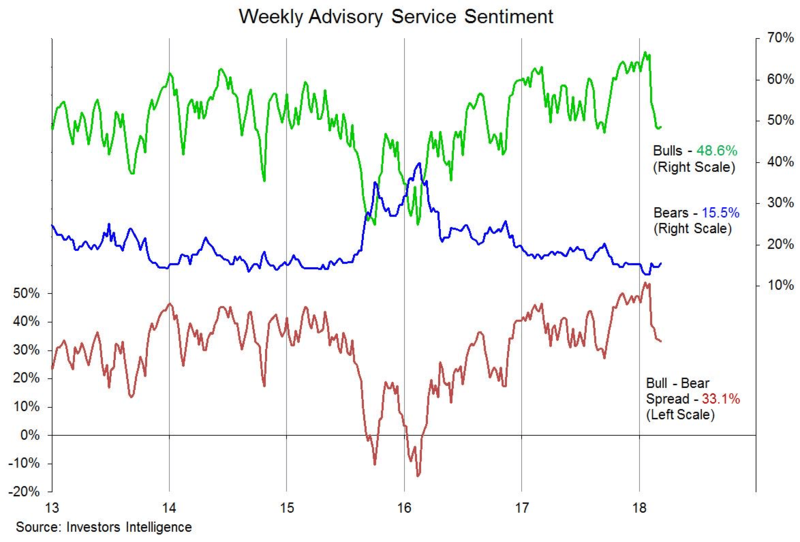 4) Investors’ sentiment is still very bullish (source AAII). 5) Based on historical market behavior I believe, this bull market has about 2 years in life ahead in front of us. What do you think? Are we nearing the end of this bull market?